A screening mammogram is a specialized X-ray that takes images of male or female breasts in order to identify potential sources of cancer. The age that you begin going for mammograms differs based on your family history of breast cancer, genetic factors that can make you predisposed to cancer (such as the BRCA genes), or a personal history of other cancers. Because it is normal to be nervous before your first mammogram, you should take the time to educate yourself about what to expect. Mammograms can be uncomfortable, or even painful, but are necessary in order to ensure that you don’t currently have an early stage of breast cancer. Make sure to avoid dresses or other one-piece clothing on the day of your mammogram. If you are sensitive to pain, you may want to take a painkiller before the procedure. Soon after you arrive, you will be escorted to a small dressing room where you can remove all clothing from the waist up, as well as any jewelry or other accessories. The attendant will provide you with a gown that ties in the front, and may allow you to place your clothes and other belongings in a secure cabinet. 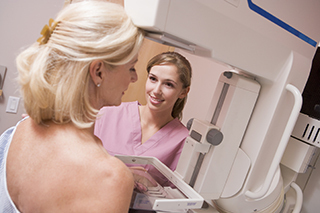 A technician will take you into a private room with a large X-ray machine used specifically for mammograms. In order to get an accurate picture, the technician will need to manually place your breast onto a platform and manipulate it so that it is positioned correctly. The technician will also ask you to move the rest of your body so that the mammogram can focus on the breast tissue without any obstructions. During the actual X-ray, your breast will then be sandwiched between two plates so that the X-rays can penetrate the tissue, as well as so that breast tissue remains completely still. This can cause some discomfort, and even pain, but lasts for only a few seconds at a time. During this time, you should stand as still as possible and hold your breath when the technician asks you to. It is extremely common to need to retake an X-ray due to some concern that the technician will find while reviewing the images. Most of the time, these concerns do not end up being cancer, so expect to be called back from the waiting room a second time. If you’re one of those lucky ones whose pictures come out perfectly the first time, you’ll be happily surprised. 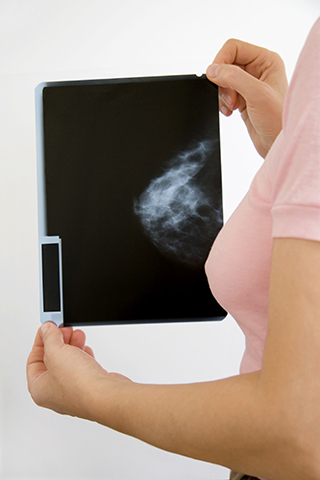 You will not receive the results of a mammogram the day of the test. In the US, the facility legally needs to send you the results within 30 days, but they usually arrive even sooner.